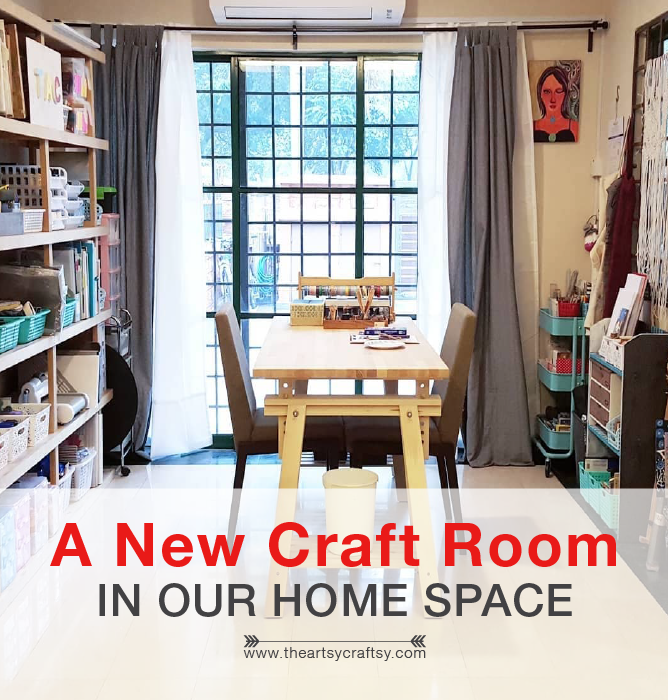 A New Craft Room in Our Home Space - Every Crafter's Dream! In the past few weeks, I have been on and off on social media, and finally on again after settling down in our new home. We have just relocated to a new home in Bukit Jelutong, Shah Alam (that's Selangor, Malaysia to my international readers) and moving has definitely taken a toll on me. It hasn't been easy to manage in between moving, unpacking and making sure that I am updating The Artsy Craftsy. I am grateful that the moving and unpacking process has finally dialled down a bit, and we are no longer living out of boxes! My last few weeks and days before the move was such a blur. Everything happened so quickly. It wasn't long before that when we made the decision to relocate, and it truly felt as if we moved with just a snap of a finger. All I can remember is the stress and tiredness during the move because we also had to deal with minor renovation and fixtures too. 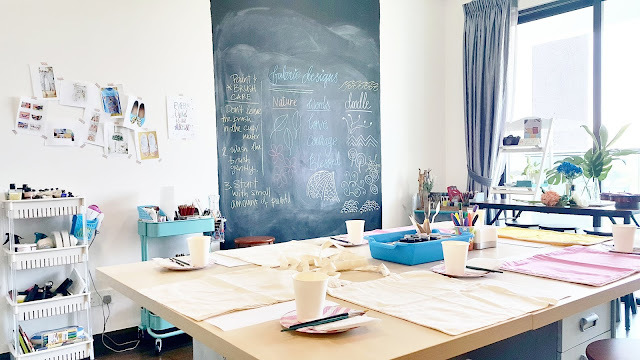 My previous space was a dual-key unit condo; we took the liberty to turned the other unit into my craft studio, somewhere I can work, teach, meet with my clients and basically just make art! The place has served me well for the past 2 years, and after that, I finally bid goodbye to it to start a new craft adventure somewhere else. 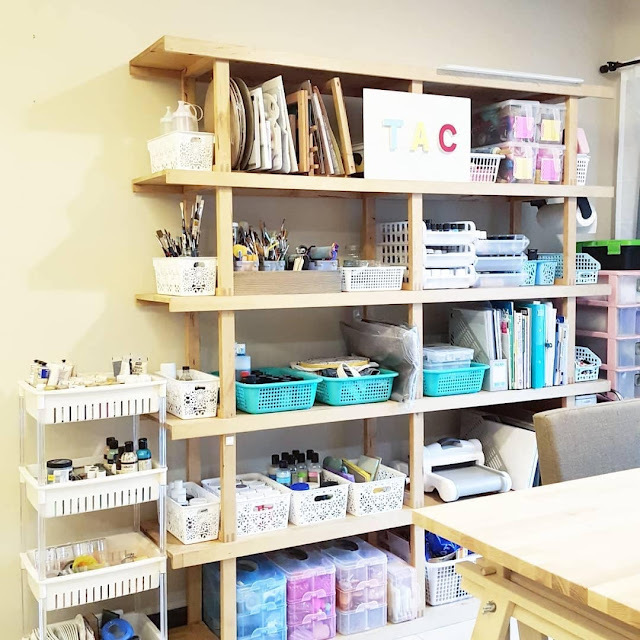 During the process of rebuilding The Artsy Craftsy's new craft room, I have come to realize a few things. I learned that even though I enjoyed my spacious craft room so much, but I was also missing out on a few things- I slowed down on blogging or writing, I slowed down on connecting more with my community in person because I was fixating on the fact that I have to sustain my space. I was not able to go out much to get inspiration from nature, and the only thing that I see day to day is the after-work traffic on the highway. I guessed that's why there's the saying, you can't eat the cake and have it at the same time. You win some, you lose some! A chance to relocate became a project for me not just to rebuild my space again but for me to redefine myself as a blogger, an artist and a crafter, and to rediscover my edge again. 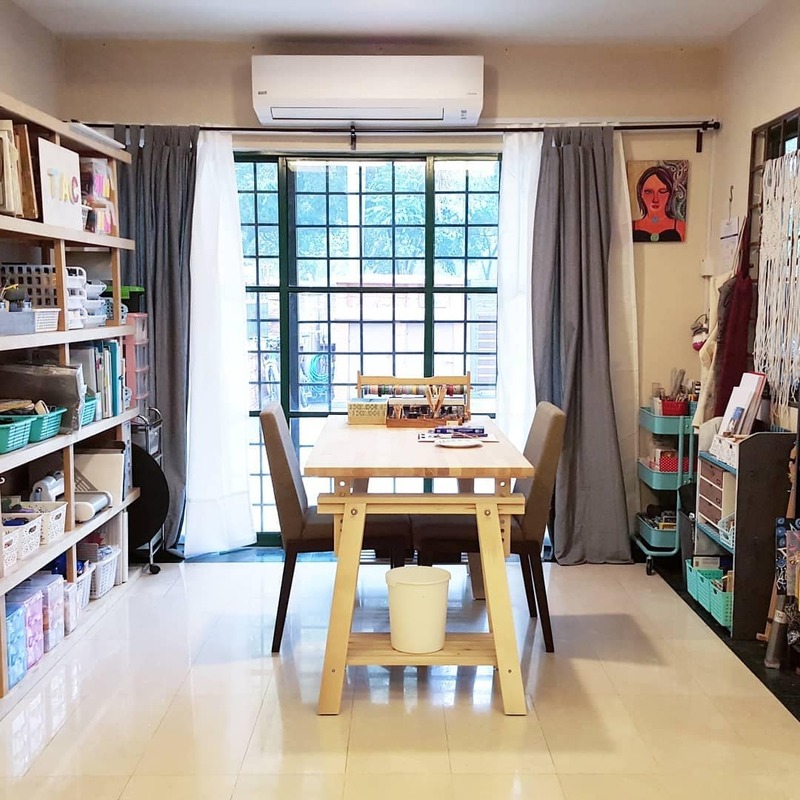 Now, the new space may no longer be a craft room of its own or as spacious as how it used to be in the previous space, but this time I am much closer to nature. To be able to just easily step outside and breathe fresh air or paint and craft with trees and blue sky as my view. The crafting space may have downsized, but the seating area is now extended out to exclusively fit more than 10 - 12 pax or slightly more. So again, you win some you lose some. But then again, it is all about making do with what you have and making the best out of it, right? Just like what I did to my space. In our new home, I was given a nice square corner to work with. This space is part of our spacious living room, and I believe it was meant for a reading corner because it is next to the glass door. Instantly, I saw potential in the space, and I knew I wanted my new work area to be there. For craft room storage, I used mostly shelves and trolleys. There were four long Ikea CD shelves that came with the house. I moved the dividers around a little bit and turned it into a shelf for my some of the arts and craft supplies. 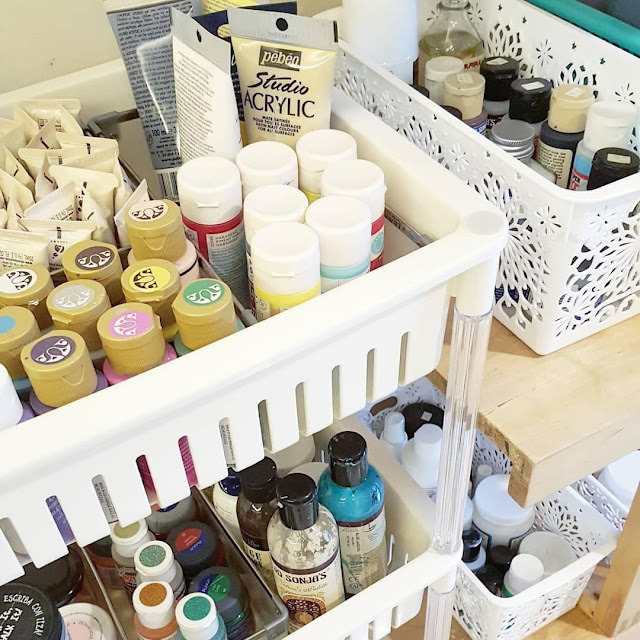 Pro tip: For organizing craft supplies in a craft room, use trolleys and baskets. 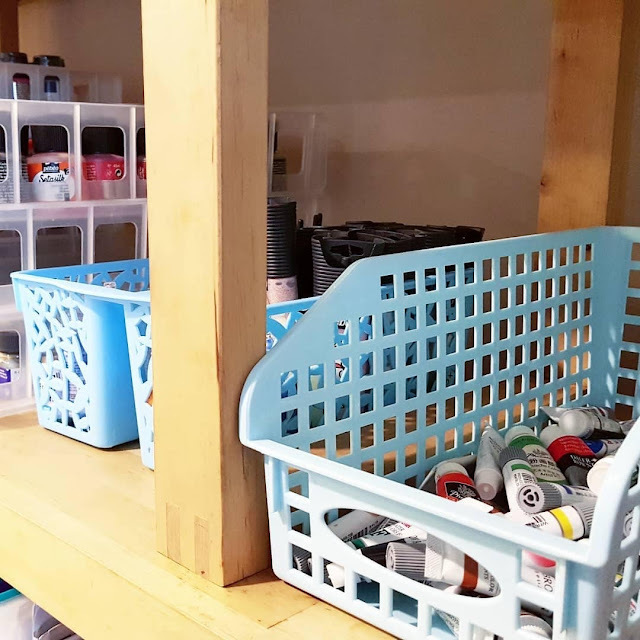 I used lots and lots of baskets for categorizing my arts and craft supplies, and each of it is arranged by priority or accessibility. Because I paint, journal and explore with decorative crafts, I divide the items using trolleys. 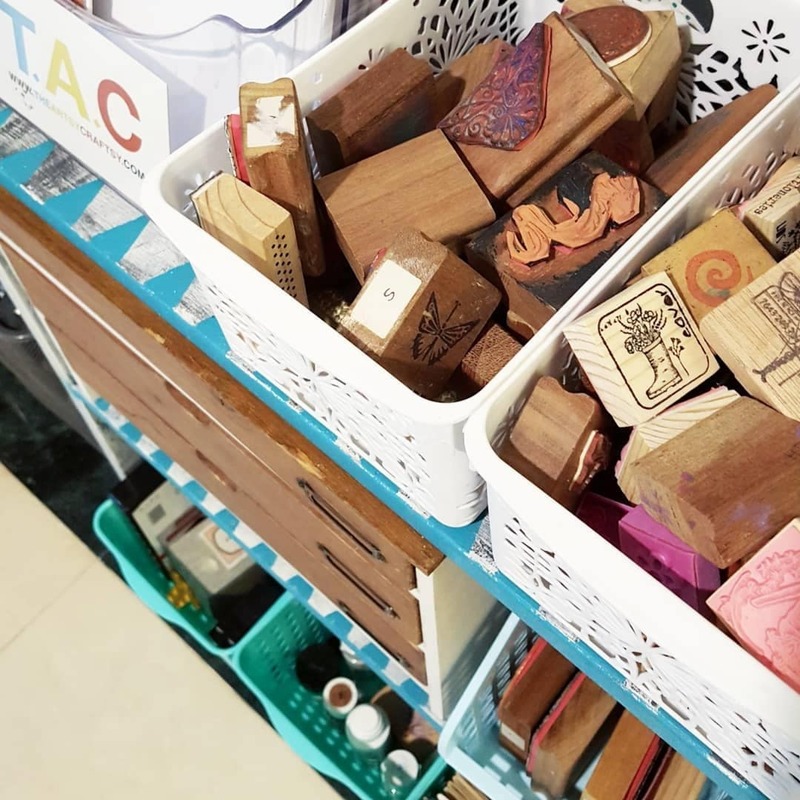 This is to make sure that things like stationeries and jewellery making stuff do get mixed up. OCD much? I know right. Haha! The goal here is minimalism. 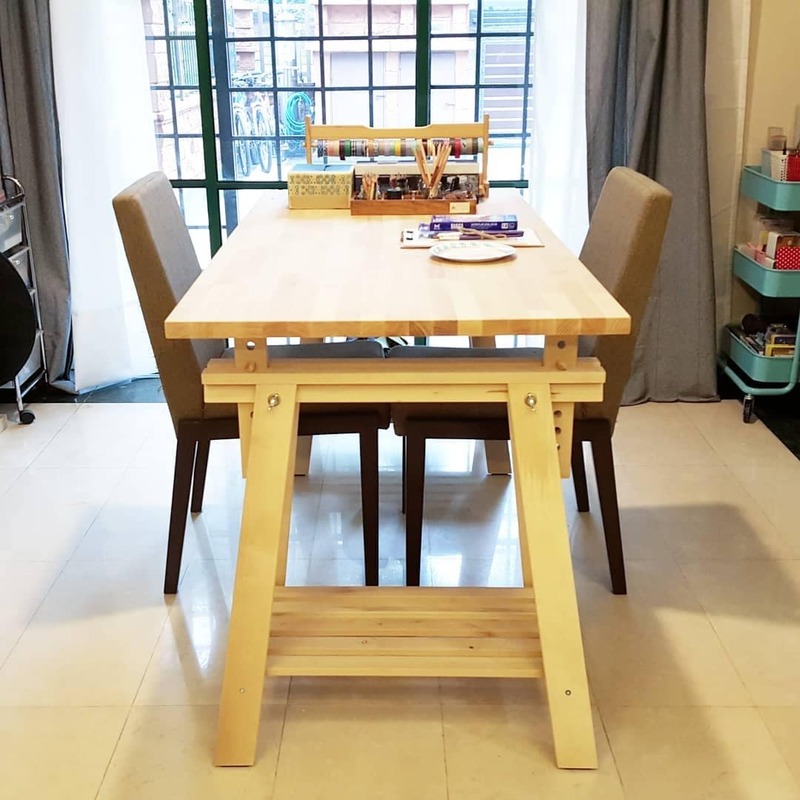 The challenge is to also make sure that it doesn't clash with the rest of my living space but blend well with the rest of our minimalist interior. I still do miss my previous space very much- who wouldn't?! there were so much light and space to play around in, but everything that happen, happened for a reason and now it is time for a new family to make new memories there. And time for us to make new memories in our new craft room. Here's to making new memories and making creative magic!